Rick and Coleen Holtz were so financially strapped several years ago after a series of failed businesses that they were about to send their kids to live with their grandparents. Desperately casting about for ideas to make money, they designed leather keychains and started selling them on Etsy. They were an immediate success. The north Alabama couple quickly expanded their leatherworking skills by watching YouTube and reading books. "We started prototyping and teaching ourselves," Rick Holtz recalled. Holtz Leather Co. now sells wallets, handbags, journals, portfolios, belts and more worldwide in an enterprise with a story so inspiring that reality TV producers want to do a series on the couple and their six children. The keychain started it all in March of 2015. Soon they were working in a warehouse off U.S. 72 and employed about 25. They kept the space but moved manufacturing operations upstairs in the circa-1926 Lincoln Mill general store on Meridian Street when a friend was renovating the historic building. Upstairs, their employees cut, stitch and "deboss" — imprint names, logos and designs — all types of leather goods that have been featured on "Today," the Glenn Beck program and in Southern Living and Country Living. Almost on a whim, they opened a retail store there on Black Friday of 2017. 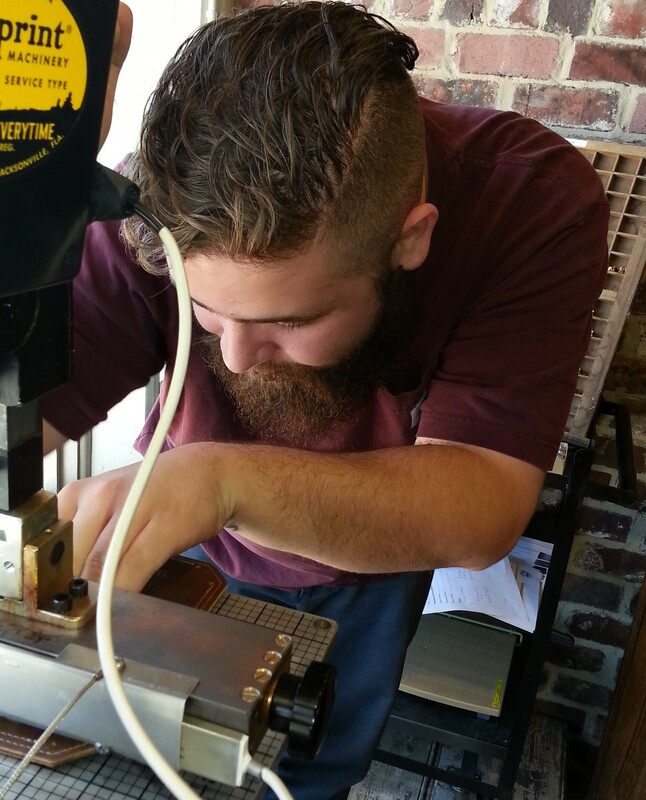 Employee Zach Polk 'debosses' an item while a customer waits. Although the couple once had no experience making leather goods, Holtz R&D director Emory Eledui said their product now "rivals some of the best leather-makers out there" and is sold across the country as well as Japan, Australia, Europe, Russia and South Africa. "Everything that's made here we taught our employees," Eledui said. 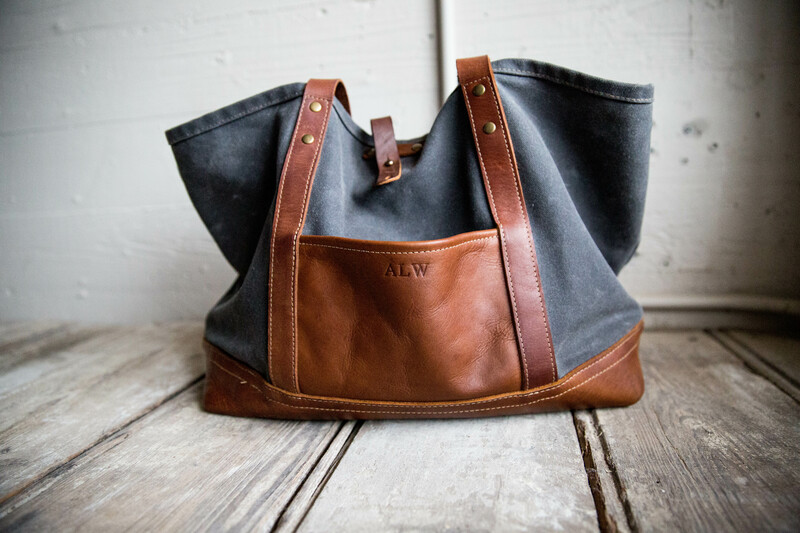 Their goods are all American-made using quality materials. Eledui said the products use full-grain leather from the entirety of the hide. By contrast, top-grain leather can lose its strength over time and "genuine leather" products are really only "sawdust of leather." Full-grain leather "tells the story more than anything else" as it ages and softens through the years, Eledui said. As hands touch it the oils condition and help preserve it. "People tell their stories with their products. They can hand it down. It will definitely last a lifetime or more," Eledui said. "It's something that will carry their own story." Holtz said they chose to focus on leather goods because "I feel like it's the all-American generational business." "We wanted something that we could also give to our children, that we could train them and teach them about business, marketing, life skills we could pass on." "I had my grandpa's journal and we felt like that was a really neat thing to have," said Coleen. Holtz Leather receives heavy 15- to 20-square-foot rolls from the tannery that are cut into specific shapes and stitched together in the upstairs workshop. Some pieces sold only in the retail store -- and prized by shoppers -- carry branding marks from the ranch. Others have stretch marks from once-pregnant cows or evidence of bug bites. "We want to be the entire experience," Eledui said. "People want to know where it came from, how it's made and the story behind it." Each piece is personalized with the buyer's name. They also add a "secret message" provided by the buyer inside their belts. One woman bought a messenger bag for her son to use at his first job overseas. "It's a piece of Alabama going to Germany," Eledui said. Wallets ($35-$50) and belts for men have been most popular. 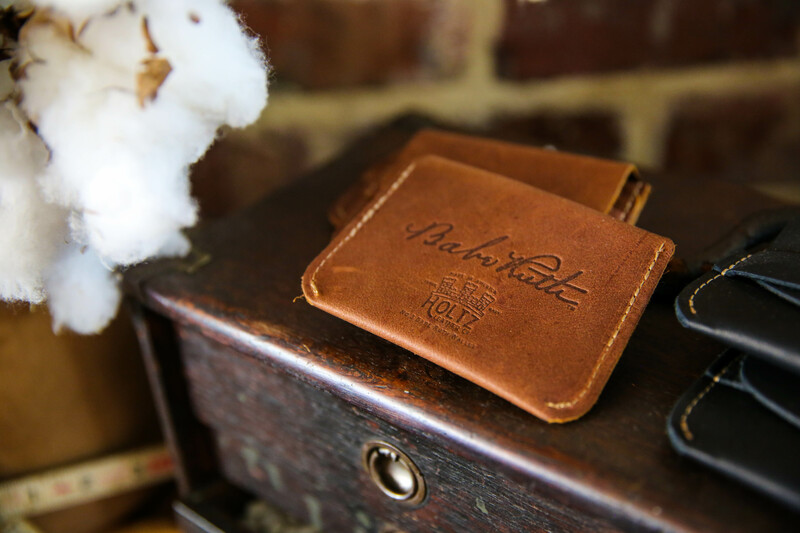 The best seller is the Babe wallet with the imprinted signature of baseball legend Babe Ruth (whose daughter, then 99, signed the contract). A field journal is $60; the Moleskine notebook-holding journal diary $74; keyrings from $14; and a women's "Derby Bag" $198. Quirky items like a leather flyswatter, marshmallow roaster and bowties have made their way into the product line. Hand-turned pens, guitar hangers, cigar holders and more are made with wood from Tennessee whiskey barrels. Bison leather items include wallets and pillows. The company is a family operation. Their kids work on home-school assignments on a table upstairs. Daughters do accounting and social media and everyone stuffs boxes at Christmas. Their Christian faith is a key part of their lives — and the business mentality. "We short-sold our house, lost our cars, had multiple sheriffs at the door presenting multiple lawsuits for credit cards, but we never filed bankruptcy," Holtz recalled. "We lost everything to the point we were two weeks away from living in our car, being homeless or splitting the family — half living with her family, and half living with my family. It got pretty dire and pretty bad. A Holtz Leather Co. tote bag. "I can't express how much the Lord has blessed us. It has been phenomenal growth. From working in our basement to in three or four years be where we are, pushing 50 employees," said Holtz. Difficult times change your perspective, Holtz said. "We knew that if we were able to get back on our feet we would do things differently. We wanted a business that was not solely about making money. Obviously businesses are here to make money, but to also pour into our people. Anybody that comes into our company we want to love on those people. "If we can help develop them to become better people, and have better marriages, and be better members of society, that's what we want to do. "We were content with little and we are content with where we are." They also want to fund adoption efforts and are themselves in the process of adopting. "We are a family that remains passionate about hard work, family and the oppressed — especially children," their website says. Their website includes a sweet picture from the couple's junior prom and photos of them hand-in-hand walking with their children, ages 5-20. The company logo was inspired by a dream that Holtz had of a collapsing castle. He was compelled to go in and was protected by a tree. "I realized I had been saved from the storm," he said. "We clung to that dream through losing everything." High Noon, the TV production company behind "Cake Boss" and "Fixer Upper," approached them about doing a reality series based on the photogenic young couple and their kids. Holtz turned them down. It would have been too much of an "intrusion." Holtz Leather recently began running local TV commercials because many people didn't realize they were in Huntsville. On Saturdays they attract customers from Birmingham, Montgomery, Nashville and Mississippi. "We see ourselves as a gateway to Huntsville. We are about to publish a catalog that highlights areas of Huntsville and products," Eledui said. Holtz's retired father makes the wood items. Product offerings will be expanding again in the next month or so. "We're currently working our own pottery line," Holtz said. So PLEASE!! !, if you remember our family pray for us! We will need wisdom, patience, and mercy.